Street by street, block by block, organized by city ward, PrayforNewark's squads of church members are walking their city, praying for residents and businesses. Launched on Martin Luther King Day in 2008, its leaders claim their effort now fields enough volunteers to pray for almost every street in the New Jersey city. Endorsed by Newark's liberal mayor, PrayforNewark would seem a blessing for any city. What could be wrong with prayer ? But the effort is directly tied to an international movement that, as detailed in my new video documentary Transforming Uganda, played a significant role in organizing and inspiring Ugandan politicians who have backed the internationally notorious "kill the gays" bill, the Anti-Homosexuality Bill currently before Uganda's parliament. The ecumenical coalition behind PrayforNewark is led by Rev. 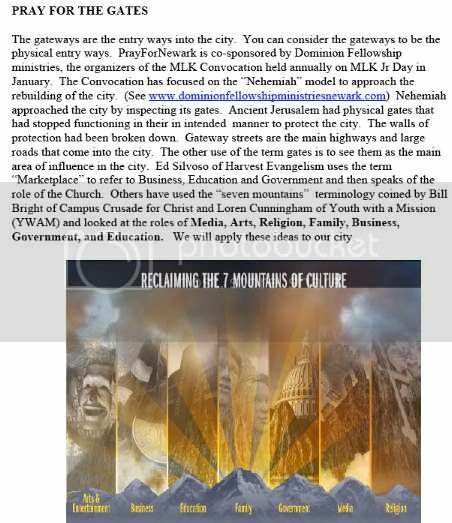 Bernard Wilks, whose Dominion Fellowship Ministries newsletters for PrayforNewark have repeatedly called for "enemy identification" and a document on the official PrayforNewark web site touts the "Seven Mountains" program which calls upon born-again, charismatic Christians to take dominion over key societal sectors such as business, government, media and education. Given the benign-seeming exterior of PrayforNewark, it is likely that many Newark citizens involved in the effort are not fully aware of the ideological roots of PrayforNewark, or of its links to international entities tied to the Uganda bill. PrayforNewark was founded by Newark suburb resident Lloyd Turner, who in October 2008 spoke at an Argentina conference of the International Transformation Network (ITN), whose CEO Ed Silvoso wrote, in his 2007 book, Transformation: Change the Marketplace and You Change the World, that homosexuality is caused by demon possession and that HIV and AIDS can be cured through faith healing and prayer. According to Silvoso, the entire national police force of the Philippines is being indoctrinated in this ideology. Lloyd Turner and Bernard Wilks are active leaders in the international "Transformation" movement, which holds an eliminationalist agenda and holds up Uganda, close to legislating execution by hanging of an entire segment of Ugandan society, as a shining model of "transformation." During the 2008 Argentina ITN conference, PrayforNewark founder Turner presented Newark as a developing US prototype for the transformation movement that could spark a wave of similar efforts to sweep across the cities of North America. At a November 2009 Transformations conference held in Hawaii, Lloyd Turner stated that his effort, which was barely a year and a half old, had achieved 97 percent coverage in Newark. In cities, towns and even nations around the globe, ITN is working to integrate government and police with church efforts to achieve dominion over all sectors of society. In Orlando, Florida a church initiative is coordinating its prayer walking campaigns, billed as reducing crime, with the local police departments. Orlando's transformation effort, dubbed "Operation Armor-All," was in fact initiated by the head chaplain of Orlando's police department. As stated in a story by Teri Arndt first posted at the web site of Orlando's First Presbyterian church, describing the birth of Operation Armor-All, "[Police] Chaplain Wade spoke to the Chaplain Corps and together they came up with the plan. The Chaplains contacted up to 22 churches." Operation Armor-All is associated with Vision Orlando, a heavily politically connected, city-wide effort in Orlando listed as a Transformation ministry under George Otis, Jr.'s Sentinel Group. Outside of the United States, such integrated government-police-church efforts become coercive in nature [note: for more examples of Transformations efforts in the United States see my colleague Rachel Tabachnick's Resource Directory for The New Apostolic Reformation ]. "We just came back from a trip to Malaysia, Indonesia, Singapore, Philippines - I mean, three out of four [of these] nations are deeply, deeply, immersed in anti-Christian social philosophy, and when my time comes to share, I'm going to share testimonies that are going to edify you so much, and it will make the Transformation of San Francisco look like a Sunday School picnic. ...Just to give you one example, 58 high ranking army officers in the Philippines were introduced to a Transformation teaching based on the Purpose Driven... ah.... Purpose Driven Life book. Seventeen generals received the Lord. And one of those generals who received the Lord in April was appointed the National Chief of Police in September. That's just a few months later. And one of the first orders that he signed was that the 184,000 police officers in the Philippines, that's the entire police officer [force] of the nation, should undergo Transformation training within six months or be fired." As the trailer for "A Force For Change," a new feature-length documentary produced by the Sentinel Group, a "Transformations" video production entity, states, "God wants to use the [Sao Paulo] police force to leverage transformation of our society." According to the producer of the documentary, George Otis, Jr., Sao Paulo's police themselves are engaged in the process of "spiritually mapping" out alleged enemy forces within their city. A newly released December 6, 2009 Human Rights Watch report accuses Sao Paulo police of extra-judicial killings, and the rise in such killings detailed in the report closely tracks the rise of Sao Paulo's Christian police association, founded in 2003 among Sao Paulo's over 100,000-strong police force, that is celebrated in Otis, Jr.'s video. The Sao Paulo effort and PrayforNewark are both identifiably in the same "transformation" movement. Seeds of the same aggressive church-government integration evident in Sao Paulo seem also evident in the PrayforNewark literature. 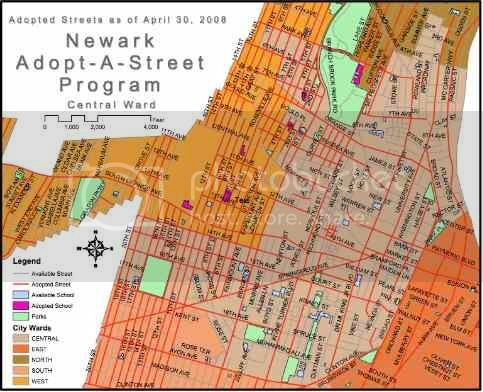 A PrayforNewark Adopt a Street program brochure features, prominently, a photograph of "Guest speaker Sgt. Leslie Jones, Jr.... a longtime member of the Newark Police Department" who is "Senior Pastor at Charity Baptist Church in Newark. He is also on the leadership team for the Pastors Clergy Council." PrayforNewark has been showcased in an over ten minute promotional documentary video, in which founder Lloyd Turner touts the roots of his city, founded as a Christian theocracy. Introduced by ITN head Ed Silvoso as depicting "Transformation Newark," in the video Dr. Bernard Wilks uses decidedly militant language to describe the program, stating, "we need what, in the military, they call `air supremacy'. And, with the air supremacy, we can send in the troops. And this city will indeed be transformed." In the documentary PrayforNewark founder Turner blames Newark's historically high crime rate on alleged sins of Newark's residents - who he claims have deviated from the theocratic vision of Newark's founders leading, claims the video, to a "dark and oppressive spiritual atmosphere" over the city. The International Transformation Network has prototype cities around the globe and at least one prototype nation which ITN leaders claim is well along in its "transformation" : Uganda. ITN claims to be training a network of "apostles," across Uganda, spanning 14,000 churches. ITN is also training members of the Kampala New Covenant Church, founded by a daughter of Ugandan First Lady Janet Museveni, that has been attended by Ugandan parliament member David Bahati - who drafted and introduced the Anti--Homosexuality Bill, now before Uganda's parliament, which would mandate the execution of HIV positive Ugandan citizens. At the 2008 Argentina ITN conference, in place of Ugandan First Lady Janet Museveni - who had attended previous conferences but had to cancel at the last minute, the head of Uganda's Tax Revenue Authority, Allen Kagina, spoke as a representative of Uganda's transformation (see Transforming Uganda). But as gay rights activists such as Jim Burroway and Tim Kincaid, along with Human Rights Watch, have extensively documented, Ugandan government and church officials are deeply implicated in using their positions to attack gay rights in Uganda. According to a 2007 Human Rights Watch report, "[The] Uganda government officials have regularly threatened and harassed lesbian, gay, bisexual and transgender Ugandans." On December 11, 2009, a United Nations General Assembly panel discussed abuse of gay rights in Africa with Ugandan Victor Mukasa, who fled Uganda following police brutality because of his sexual orientation, stating that "Lack of security, arbitrary arrests and detentions, violence, and killings of LGBT people have become the order of the day in Africa." Also attending the UN panel discussion was the Reverend Kapya Kaoma, author of a new Political Research Associates report, "Globalizing the Culture Wars: U.S. Conservatives, African Churches, and Homophobia," that accuses American evangelicals of exporting homophobia to Africa. Pray For Newark has been enthusiastically endorsed by the administration of Newark's indisputably liberal mayor, Cory Booker, who recently invested political capital in support of gay rights, signing on in support of the effort to legalize gay marriage in New Jersey. But Dominion Fellowship Ministries founder Rev. Bernard Wilks is an "apostle" in the International Coalition of Apostles (ICA), an organization whose apostles promote "transformation" and Christian dominion over ethnic communities, cities, and nations. ICA convening apostle C. Peter Wagner is over a network of several hundred apostles who in turn have in some cases hundreds or even thousands ministries under them. Along with Wagner, ITN head Ed Silvoso sits on the ICA's elite Apostolic Council, which "provides advice and accountability" for the Apostolic organization. Although C. Peter Wagner had been building his "spiritual warfare" networks for over a decade, it was not until 2001 that he declared that the New Apostolic Reformation had begun and launched his International Coalition of Apostles. Wagner envisions his effort as a "second reformation" of the church, a postdenominational movement in which traditional denominations will cease to exist and charismatic Christians will come together from across the spectrum to bring about the "Kingdom" on earth. The New Apostolic Reformation's international network of apostles and prophets includes Lou Engle, founder of TheCall, which maintained eight campaign offices in California to manage volunteers in the pro-Proposition 8 effort whose leaders subsequently boasted, after Prop 8 had passed, that they had fielded over 60,000 volunteers. Engle's organization also held the pro-Prop 8 capstone rally, in San Diego's Qualcomm stadium on November 1, 2008. At the end of the day long rally, Engle and his young disciples made calls, from onstage, for martyrs for the cause. According to Lou Engle, iearly in the last decade he and Kansas US senator Sam Brown shared, for seven months, a rented Washington, DC condominium. During the 1990's and into the first decade of the new millennium, along with New Life Church founder Ted Haggard with whom Wagner co-founded the World Prayer Center, Peter Wagner played a major role in developing, popularizing, and exporting to Africa and the world the practice of "Prayer Walking", a PR euphemism for the practice of Spiritual Mapping which, per Wagner's writing, advocates that Christians create maps of alleged demonic forces but also political and ideological opponents within their cities and towns. Part of the "Spiritual warfare" movement that gained slight media notice in the 1990's and into the next decade, Spiritual Mapping is a process through which a geographic area is covered, block by block, to identify the demons which block the community from "transformation." These demons must be expelled in order for Christians to unify and take control of government and all spheres of culture, a "transformation" that is advertised by the movement as bringing about Christian mini-utopias. In his 1993 book Breaking Spiritual Strongholds in Your City, Wagner instructed spiritual mappers to note "locations of high places, altars, temples, monuments or buildings associated with witchcraft, occult, Freemasonry, Mormonism, Eastern religions, Jehovah's Witnesses and the like (page 229). Wagner then asks, "Do any of these form any patterns when plotted on a map ?" Wagner's list of enemies does not stop there. He identifies as "cults" Islam, Baha'i, and New Age belief systems generally. Enemy ideologies on Wagner's list include communism, marxism, socialism, humanism and atheism. Even the Roman Catholic Church isn't safe - it is corrupted according to Wagner by a demon known as the "religious spirit" which is the spirit of empty legalism and religious ritual. In his 1998 book Confronting The Queen of Heaven, Wagner describes how leaders in his movement traveled, in September 1997, to Nepal to destroy what they claimed was a monument, high up on Mount Everest, that served as the physical locus for a global-level demon spirit called the "Queen of Heaven" which, according to Wagner, was blocking the prayers of Catholics and Muslims from reaching heaven. Although the Transformations movement bills itself as a form of enlightened Christian conservatism, "spiritual mapping," both as an ideology and a practice, is less than two decades old. The term "spiritual mapping was coined by George Otis, Jr., in the late 1980's and the practice of Spiritual Mapping was pioneered during the same period, in the Argentine city of Resistencia. At the 2008 ITN / Transformations conference in Argentina, PrayforNewark founder Lloyd Turner forecast to his audience that his Newark effort would be America's "Resistencia" that could spark in cities across the United States similar prayer walking (spiritual mapping) initiatives. The Transformations movement holds conferences, each year, around the globe and boasts its own line of documentary videos, from George Otis, Jr., founder of the Sentinel Group, depicting purported case studies in which public prayer initiatives led by Christian churches working closely with local government structures achieve miraculous "spiritual" breakthroughs that, in turn, result in miraculous declines in murder rates and dramatic increases in adherence to "spirit filled" evangelical Christianity. Otis, Jr.'s Transformation movies depict the "transformation," of Uganda and cities and towns around the globe, into Christian utopias the videos claim have undergone dramatic reductions in crime, corruption, poverty, and even miraculous curing of HIV/AIDS and other diseases. One of Bernard Wilks' fellow apostles in Wagner's International Coalition of Apostles is the Rev. Samuel Rodriguez, who has prayed together with Barack Obama, shared a podium with the late Ted Kennedy, and heads the National Hispanic Christian Leadership Council that claims to represent within the US ten million Hispanic evangelicals and five million Hispanic charismatic Catholics. Rodriguez, who has participated in Democratic inside-the-beltway centrist efforts, has touted the effect of black and Hispanic evangelicals in passing California anti-gay marriage Proposition Eight and publicly railed against "radical homosexuals," as well as declared his intent of fusing antiabortion politics, and the "legacy of Billy Graham" with "the legacy of Martin Luther King." Another of Rev. Wilks' fellow ICA apostles is Harold Caballeros, a star in the Transformations movies and also a former Guatemalan presidential candidate. Almolonga Guatemala was featured as a prototype in the first Transformations movie, which also featured Kenyan pastor Thomas Muthee who anointed Palin at her Wasilla Assembly of God church prior to her becoming governor of Alaska. Caballeros explains in his book Victorious Warfare that while spiritual warfare involves battling demons, it also refers to any "strongman; literally, a human being who has made a covenant with the devil or with certain demons, and who has been given spiritual dominion over a determined territory." Caballeros has also stated in Guatemalan TV broadcasts that he supports extra judicial killings of criminals in Guatemala by evangelicals in the police force. "The death squads that still function within the PNC and the Ministry of Government, are a holy enterprise that is organized by agents and personnel from Evangelical churches that know our obligations to society...I must recognize that the story published in the New York Times on March 5 of this year is true; the "social cleansing" that, together with Carlos Vielman as Minister of Government we carried out in the institution, had to be done and must continue, as I understand has been ordered to the new authorities..."
"Christians in the global South are way ahead of us in this area. The values of the kingdom of God should penetrate every level of society, and they understand that. ... [Caballeros is] doing it right, going right to the top and taking dominion." Another of Bernard Wilks' fellow ICA apostles in the 500-odd member apostolic organization is Jim Ammerman, whose chaplain endorsing agency controls 6-8 percent of the active duty chaplains in the US military. In September 2008 Ammerman printed, on the first page of his official chaplain endorsing agency newsletter, a letter from a retired US military that called for Senators Obama, Clinton, Biden, and Dodd to be executed for alleged treason. During the 1990's Ammerman made a national barnstorming tour in which he claimed Bill Clinton had signed executive authority over to the UN and that up to 1.3 million foreign troops hidden on US military bases and in national parks were immanently ready to seize power and throw US citizens into concentration camps. In those talks Ammerman's also asserted that Jewish bankers, under sway of satan and led by the Rothschild banking family, controlled the US and world economies. "Our Prayer Warriors Across the Nation"
"...last year was elected Governor of the state of Alaska. Yes! Hallelujah! At her inauguration she dedicated the state to Jesus Christ. Hallelujah! Hallelujah!" "There is a tipping point, at which, at which time, because of the sin of the land, the people then have to be displaced. But while this measure of wickedness is rising, the measure of faith in the church is rising. God is preparing a people to displace the ones whose sin is rising so that then they tip over and the church goes in - one is removed and the church moves in and takes the territory." In October during the 2008 presidential election, then-GOP vice presidential candidate Sarah Palin appeared on Focus on the Family founder James Dobson's Colorado radio show and thanked "our prayer warriors across the nation." *Note: I've amended this story. Originally, I included Peoria, Illinois as another example along with Orlando. The major of Peoria, Jim Ardis, himself launched Peoria's "40 Days of Prayer" initiative that brought together a coalition of church leaders in the initiative, and the city-wide John 17 pastors association that has since sprung up to push for Peoria's "transformation" has had, as a guest speaker at a recent event, Rhonda Hughey of Fusion Ministries. Hughey is a Transformations Associate with George Otis' International Fellowship of Transformation Partners. Fusion Ministries is co-producing a Transformation effort, by a consortium of Peoria churches, called "The Divine Experiment," Further, many of the churches in the citywide effort, such as the Bradley Epworth [Methodist] Church have been consumed by New Apostolic doctrine. But so far I've found no clear evidence the Peoria effort is directly under Ed Silvoso or George Otis, Jr.
By contrast, the Orlando police/prayer program, Armor-All, is associated with Vision Orlando, which is listed as a Transformation Ministry under George Otis, Jr. And, the Orlando Armor-All program was conceived and initiated by the head chaplain of Orlando's police department, who contacted area churches to enlist them in the effort. Additionally, while Peoria's prayer campaign appears to have been conducted primarily through prayer within churches, the Orlando effort was conducted by church prayer teams walking high-crime areas of Orlando... supported by police units. It is the close integration of church and police efforts in Orlando which raises the specter of government-supported religious coercion. Jesus says that Christians should not pray for things but when they pray they should pray, in secret, the Lord's Prayer. Let us hope that these fake Christians with their prayer networks for wants, desires and things gets exposed. We can see the destruction of Christianity by Christian wannabes as the Christian worldview embraces these charlatans. I've read Clarkson, Goldberg, Blumenthal, Hedges, Sharlet, and Schaeffer, plus writers at T2A. There is a consensus that the Christian nationalists are a radical, revolutionary movement. Their objectives, strategy, tactics, and organizations are becoming better known. My question is whether or not ordinary journalists are aware these studies. Does T2A have a training program or an outreach program to journalists in America where these transformation churches are operating? Obviously, there is a great deal of useful information on the T2A site. In his book Eternal Hostility, Clarkson indicated that writers (for example, journalists) need to know how to write about the Christian Right so that religion itself is not being attacked. Anyway, just a thought. In my experience, average journalists have very little knowledge of the movement discussed on this web site. The reasons are complex, and it would be unfair to heap blame on the journalistic community. We're working on developing the ability to enact the sort of outreach you've described, and help towards that goal is welcome. I clicked on the link for Peoria, IL, and the site is the Peoria Association of Pastors blogspot. Reading Rev. Burnett's blogs does not suggest he is into spiritual warfare or using solely the power of prayer to reduce the murder rate and other crimes. On the contrary, in January 2008, the pastors wanted to meet with city and police officials to reduce crime, including achieving better police-community relations. In February 2008, the Pastors worked on a gun exchange program--the details of which are not clear on the website. In April 2008, the pastors were discussing police brutality issues with the police. Rev. Burnett wrote: "Although this issue is challenging and can be highly subjective, we hold fast to our premise that a safer community takes the committment of both the church, citizens of the community, and governmental agencies that professionally and adequately deliver services without exception." In January 2008, Rev. Burnett wrote: "The Black Church is where it has always been...in the middle of the conflict, suffering the brunt of poor education, economic and social inequity and desparity, and grappling with those who choose to self-medicate instead of address the establishment that has helped proliferate their condition." Maybe I'm missing something, but everything Rev. Burnett has posted gives me the impression that he is a progressive preacher doing good old fashioned community work in the black community. The Orlando example is much clearer. The pastors are just praying. That I can understand as spiritual warfare. I don't live in Peoria, but I suspect that Rev. Burnett might disagree with your characterization. I apologize if I am wrong, but I am certainly confused by the example. Jim Ardis wants to drive the city to its knees. The mayor of Peoria has invited religious leaders to meet with him at 2:30 p.m. Friday at Riverside Community Church, 207 NE Monroe St., to discuss a citywide prayer effort he's calling "Ready Set Pray" as part of the fight against crime. "I think it's going to energize the faith-based community more," Ardis said Wednesday. Prayer gatherings were the norm during a spate of slayings in Peoria earlier this year. Churches also have been involved in a recent gun buyback program. Ardis said he was inspired by an effort started earlier this month in Orlando, Fla., called Operation Armor All. That 40-day program was initiated by police department chaplains in response to an increase in violent crime. For some reason a clergy association for all Peoria clergy has never caught on. I'm not sure how conscious it is, but the associations that have existed in my 15 years here have not been able to attract across too broad a theological / political / racial spectrum -- even for the Week of Prayer for Christian Unity celebrations that happened for about a decade. Black-white; evangelical/pentecostal-mainline; inner city-suburban -- individuals cross those barriers for a while, then lose steam or other priorities take over. I'm one of those. I say this with some pride, for I have participated in and been among the leaders of some of these efforts. And I say this with some (okay, more) shame -- for I have not persevered. But I've not given up. And earlier this afternoon the Mayor greeted some 60-70 clergy and other leaders of Christian groups -- perhaps the broadest spectrum of Christians I've seen at one time in my 15 years here -- told us what he hoped we could do, then got out of our way. Zion will take part in the effort, whatever comes out of the steering committee that organized. Thanks, Mr. Mayor, for bringing us together. Bruce, thanks for the research here. I have been trying to get through to you...guess the site is broken down since no one has a new article up. I have sent a couple, but they ended up under my diary. Let me know. Thanks. We are looking for the things which is really effective for get roblox free robux which play important part in joining group at the roblox.